Note: This article written by Amy Anderson is based on interviews with Tashpolat Tiyip’s friends, students and relatives. Their identities cannot be revealed due to obvious reasons. 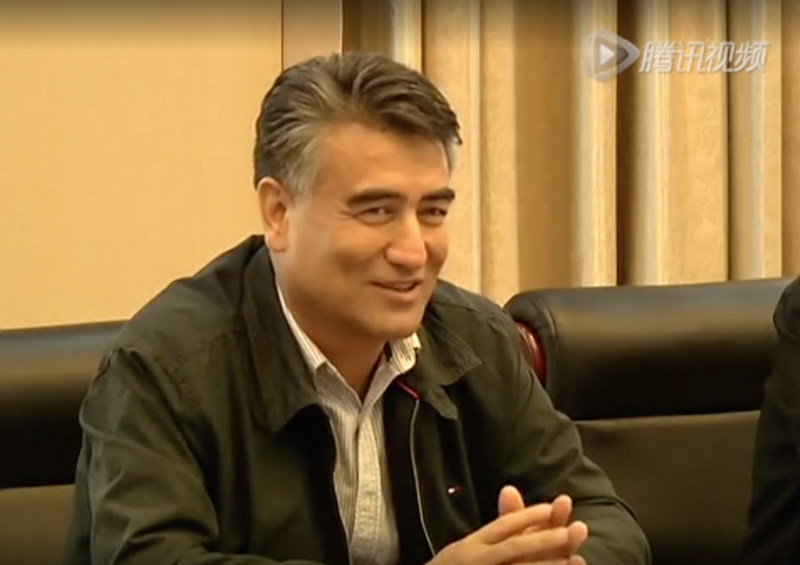 Sometime after he disappeared in 2017, Tashpolat Tiyip, the president of Xinjiang University, was sentenced to death (with a two year reprieve) in a secret trial. The Chinese state has provided no justification for this horrifying violation of human rights. Like hundreds of other Uyghur intellectuals, it has simply taken his life away. Drawing on interviews with Tiyip’s students and relatives, this article tells the story of his life and demonstrates the grotesque absurdity of the Chinese totalitarian state. A man who has dedicated his life to furthering the vision of the state and his people appears to have been sentenced to death for this effort. Tashpolat Tiyip, born in 1958, came of age during the infamous Cultural Revolution during his teenage years. 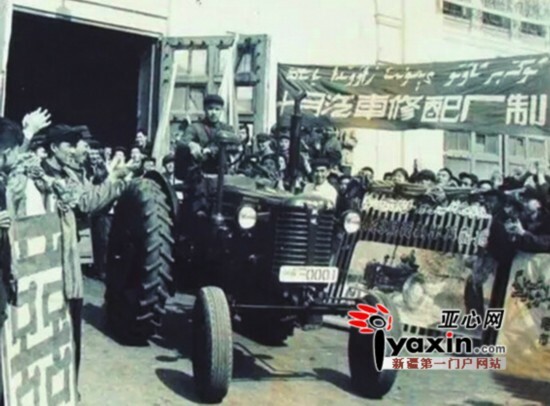 Upon his graduation from high school in 1975, he was asked to join the “Down to the Countryside Movement” and worked as a Red October tractor driver in the fields of Nilka County, in Ili Prefecture. After six months of saving his salary he was able to buy an Uyghur-Chinese dictionary. According to one of his relatives, every evening he would memorize at least 50 new Chinese words, which he would repeat over and over again while he was driving the tractor in the field from dawn to dusk. His favorite thing to do after work was to sit beside the Ili River. 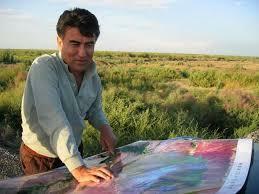 From a young age he dreamed of becoming a geographer and exploring the physical landscape of the Uyghur homeland. He had faith in a better future as he studied Chinese and enjoyed the sunset over the Heavenly Mountains. In 1977, the Chinese state declared that the human catastrophe of the past 10 years was the fault of the “Gang of Four” and the revolution was now over. Many of the youth returned from the villages to their home cities and were given an opportunity to take the national college entrance exam. Tiyip loved the landscape of the Uyghur homeland: the mountains, grasslands, rivers and streams. According to his students, he thought often about the land he had cultivated. He deeply appreciated the dry, bare, sandy, salty environment that generations of indigenous people had cultivated through hard work and, through this, built deep roots. The land was filled with stone, mountains and heat. It was the land where Uyghur ancestors had lived. The farmers he had met had dedicated their whole lives to make a living from it. As one of his relatives said, recounting the story of his life, Tiyip was thrilled to take the first national college entrance exam after the ten years of chaos, and received an offer to study Sports Education. Although his family and friends encouraged him to pursue this career as he was a talented athlete, he knew he wanted to be a geographer and help his community by learning from scientific advances in water management and agronomy. He spent the next year studying even harder and through this became fluent in Chinese. In 1978 he passed the exam with flying colors and was able to find a place in his dream major in the Geography Department at Xinjiang University. Following his graduation in 1983, Tiyip started his teaching career at his alma mater, the Department of Geography at Xinjiang University. He was deeply engaged in his research, and began experimenting with the soil in his own front yard. 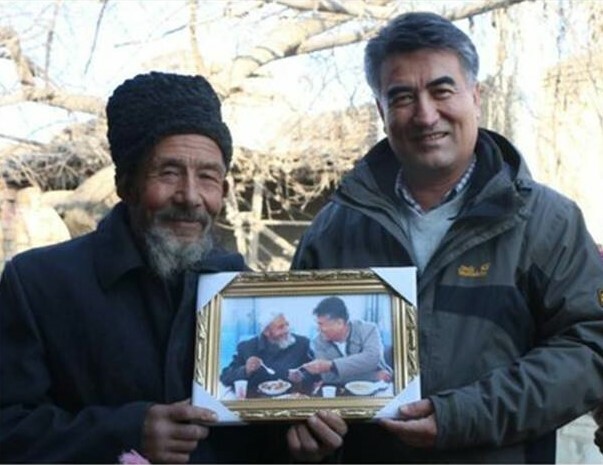 Every summer and winter break he went to do fieldwork throughout the Uyghur homeland, something he continued for 35 years. His goal was to understand and maintain the river ecology and soil by applying remote sensor technology and other systems. In order to formally pursue this passion, he enrolled in a graduate program at the Tokyo University of Science in 1988. When he left, his only daughter was just four years old. According to a friend, her picture was always in his wallet. One of Tashpolat Tiyip’s key publications: Research in Theory and Management of Ecological Environment Regulation in Arid Areas. As one of his relatives put it, during his time in Japan Tiyip often slept just 4 hours a day in order to focus on his studies. He was not only studying a wide range of professional subjects and conducting his experiments in order to complete Master’s and Ph.D. degrees in the shortest time possible, but also learning Japanese and English in order to gain access to a broader range of research materials. Astonishingly, he finished all of these requirements in four years and earned a Doctorate of Engineering in Applied Geography. By 1992, he became the first Uyghur to earn a Ph.D. in geography in Xinjiang. In a published interview from 2011 he said: “mountains, lakes, deserts and oasis coexist in Xinjiang. The land is abundant with oil, coal, copper and other rare metals. It is a paradise for environmental research. My entire career was contained in Xinjiang.” Continuing he said that while some of his cohort of fellow international students chose to stay in Japan, he was eager to come back, be with his family and continue his research in the land he loves. Since 1992, he has led more than 17 national and international research projects, published 5 books and more than 200 scholarly articles. 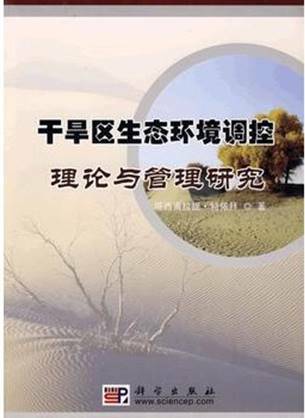 His research has primarily focused on ever-fast desertification of Xinjiang ecology, specifically the reasons for the increasing levels of salinity in the soil, the destruction of river ecology and the shrinking of water resources. His publications on a remote sensing assessment of the impact of salinization, environmental changes and human activities in the Taklimakan Desert were published in a number of different languages and received international acknowledgment. His work was particularly important in understanding the degradation of the Tarim River, Kucha River, Ebinur Lake, the essential water sources of the Tarim Basin, and community adaptation to these ecological change. Through their research Tiyip and his students attempted to bolster the sustainability of local communities who were suffering from environmental degradation. As Tiyip rose in leadership at Xinjiang University, his support for collaboration began to stand out. He took up the responsibilities as chair of the Geography Department soon after he came back from Japan in 1993. Given his track record of research and leadership in the Geography Department, in 1996 he was promoted to vice president of Xinjiang University a position he held for 14 years. Based on his excellent performance both in academics and administration, in 2010 he was promoted to the President and Vice Secretary of the Communist Party of Xinjiang University. Until his arbitrary detention at the Beijing airport on his way to a conference in Germany in late March 2017, he was widely praised for his contribution to the development of the university. Tiyip built a close relationship with more than 50 universities in 20 countries, including Japan, France, Turkey, Kyrgyzstan, Kazakhstan, and Turkmenistan. He received an honorary doctoral degree from the French Ecole Pratique des Hautes Etudes (EPHE) in 2008, in honor of his work on the environment in arid zones using satellite remote sensing. The Chinese state media published articles praising him as a model minority leader. Articles with titles such as “From a Tractor Driver to Doctor of Paris University”, stated that his honorary degree was “not only an honor for Tashpolat Tiyip, but also for Xinjiang University.” He built even closer relationships with high-ranking universities in first-tier cities in China, such as Tsinghua University, and created fellowship programs for minority graduate students from Xinjiang at these institutions. He hoped these academic collaborations would increase the education quality of Xinjiang and contribute to it’s the development and sustainability. Like many great leaders Tiyip is charismatic, funny, and smart. He is particularly known for his attention to detail. Many of his students that I spoke with admired how he balanced the administrative work and political duty so well, while at the same time continuing his research scholarship. His special attention to his graduate students made him one of the best advisors at the school, regardless of whether they were Han-Chinese, Uyghur, Kazakh, they worked together with a collegiality that centered on their shared love of geography. 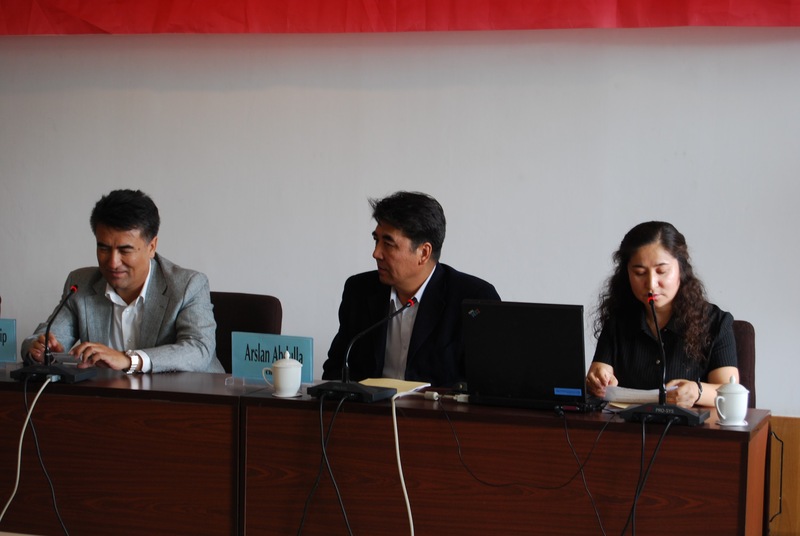 When Xinjiang officials first started the “Becoming Family” campaign, which placed mostly Han civil servants in the homes of rural Uyghur farmers, Tiyip stated that he believed it was a good policy that would create connections between elites and villagers. According to one of his students, since he was also born and raised in a rural farming family, and he had done in-depth fieldwork throughout the years with farmer communities, he genuinely enjoyed visiting and talking to the elders. In some of his research, he collaborated with the folklorist Rahile Dawut to integrate scientific data with Uyghur traditional ecological knowledge in order to better understand the cause and solution for the desertification of ecology in the Tarim Basin. Tashpolat Tiyip with a farmer who he met through his fieldwork in rural desert locations. From the perspective of his students, Tiyip has been a deeply caring mentor. From the perspective of his colleagues, Tiyip has been a wise leader. From the perspective of his family, he has been a devoted father and loving husband. Tiyip’s wife, his partner for 36 years, Venira, is a professor of information technology. She was also a collaborator on a number of his research projects. From the perspective of his daughter, Tiyip’s only child, he has been and always will be her greatest hero. According to those who are close to her, she was deeply influenced by her father’s passion for geography. She also pursued a career in the same discipline, earned a doctoral degree and became her father’s colleague. For years, their annual family vacation was fieldwork in the heart of the Taklimakan Desert, carrying sensor technology equipment, setting up their tents, building a fire, sharing knowledge and laughter. When those that were close to him heard that he had been taken away on charges of being a “two faced” person, they were dumbfounded. The question that was on all of their minds was: “Why was he taken? Where was his ‘other’ face?” Many people whom I interviewed for this article have known him to be a brilliant geographer, an amazing leader and loving father. One person told me that everyday he carved out half an hour from his busy schedule and took his granddaughter to the playground on the Xinjiang University campus. Many people remarked on how much he enjoyed watching his granddaughter play. He told a friend that he had missed his daughter’s precious toddler years while he was studying in Japan, and now he wanted to spend as much time as possible with his granddaughter. When I asked interviewees to speculate on Tiyip’s “other face,” no one could explain the logic behind his arbitrary arrest. Instead they repeatedly attested to his character and achievements. As recent reporting has shown, being Uyghur and taking pride in Uyghur language and heritage itself is enough to demonstrate “disloyalty” to the Party. But still, is such “disloyalty” deserving of the death penalty? Articles that praised Tiyip’s achievements are now being systematically deleted from the internet. His name and legacy are being erased, even from the list of presidents of Xinjiang University. Ironically, Sheng Shicai, the Guomindang leader who ruled Xinjiang from 1933-1944, who was described as one of the most evil traitors by the Communist Party, is still listed as a president of the school from 1942-1944. Yet, there is now no trace of Tashpolat Tiyip’s name. According to a family friend, Tiyip’s daughter was diagnosed with thyroid cancer in 2018, at the age of only 34. This life-threatening illness came after her father’s indefinite incarceration and death sentence. Since extreme stress and depression can result in a weakened immune system, it is possible that her health crisis is connected to the ongoing state violence that has shattered her family, and Uyghur society more generally over the past two years. As I was writing this article and was presented with overwhelming evidence of Tiyip’s moral character, I could not stop thinking: in what kind of world is a life of service to one’s country and people deserving of a death sentence? Where can justice be found in such a world? That’s not Kyrgyzstani official, that’s Turkmen Arkadag, i.e. 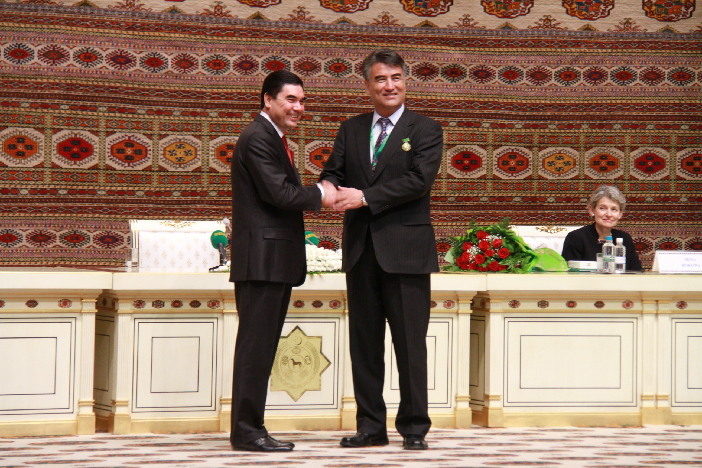 President Berdymuhammed Gurbanguly. Yes, thank you. The caption and the link to the source of the image have been updated. Thank you for all you are doing to bring information to the world about the dire situation of Uyghurs in China. What an extraordinary man, and a heartbreaking story. Hello Amy Anderson. Thank you for your excellent profile of Taspolat Teyip. I have seen somewhere elses (RFA) that he was sentenced to life in prison…so I have a question: Is there any evidence Taspolat Teyip was sentenced to death? Any official announcement of any kind? We, the Uyghur people, can’t Thank you enough, Amy Anderson, for bringing this biggest human rights abuse into the light, with your unique writings. This article just took me back to the day when I first heard about this horrific news, that was Oct 4, 2018. My heart ached then and more so now, reading all those details about his life, which is lived fully by serving the people and the country. He’s a loving husband, father and grandfather, this is very evident from the genuine smile on his face. His daughter’s medical condition that was due to this sudden horror broke my heart further. This is a living example of the biggest unjustice that our Uyghur people are forced to face in China today, by the tyranny government of CCP! Please read, and help to share to let more people to learn about the truth.